Clearly sport is a definite record breaking area. With the ability to capture so many factors relating to an event it’s not surprising. Of course, sports stars are improving their health and fitness far better than ever before. Plus any equipment used by these super athletes is always improving. Becoming sleeker. Weighing less. Increasingly faster. Feeling smoother. So I guess it’s just a natural progression in life. Now, this all makes me a little bit curious. I wonder what type of records will be achieved in the future? There are many obscure, but sometimes wonderful, records being mentioned by commentators across a variety of sporting events. 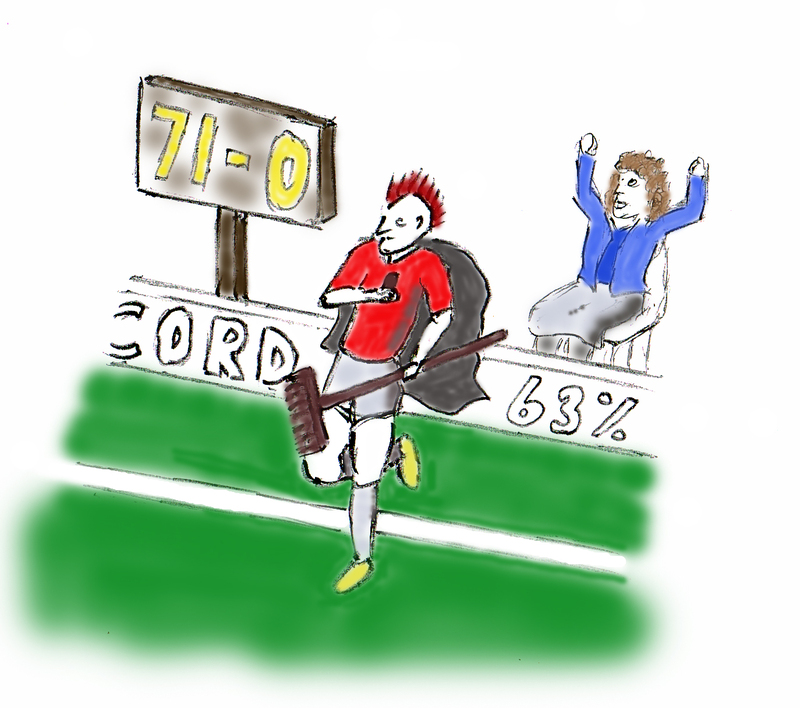 So it really wouldn’t surprise me to hear, “That’s the first time a player with a red headed Mohican, wearing a pair of yellow boots, a red shirt, a superhero cape, whilst eating a chocolate bar and holding a broom, has hopped on to the playing surface 5 minutes from the end of a game”. Crazy I know but then they mention all sorts of silly and crazy statistics nowadays. Thank goodness for computers though. After all, it would never be possible to plough through paper records piled higher than a thousand trees just to produce a stat worthy of mentioning. And all before the final whistle too remember. It does of course sound impressive when they combine several stats together. Although, it’s just a bit of showing off as obviously it’s the computer that does the hard work. For instance, “When they score first, before the 6th minute, in games kicking off at 4pm, when a woman in the front row of block 23 is wearing a blue jumper and the opposition’s fitness coach has his family in block 48 drinking water, they always win by a difference that is more than ten times the square root of the referees age”. When people refer to wins and losses they can easily determine what the trend has been, and it’s absolutely critical for bookmakers to know this. They rely heavily on trends and rather than going for a punt on something different happening they stick to their guns. I wish I remembered this fact as I’m sure they wouldn’t shoot me down as often as they do. Presumably old records have been painstakingly entered into the vast vault of current stats. What a job that must have been. The thing is though, surely they can’t be as detailed and complete as those recorded in today’s world. Can they? As an example, last weekend Stoke City Football Club played a full 90 minutes against Queens Park Rangers. During the entire match they could only manage 118 successful passes. Now I’m not sure what the average usually is but I’m guessing it’s probably higher than that. There’ll be a stat for that somewhere. Now this, as it happens, is the lowest ever recorded in the history of the Premiership. Hence why I mentioned it. Sounds a little bit of a surprise as it wasn’t against the superstar billionaires of Manchester City for instance. What Do You Mean You Didn’t Write It Down! But when I thought about it I realised that this is only going back to August 1992, when the Premiership actually began. So in the grand scheme of things it’s hardly that long, and probably nowhere near the worst performance in the history of English top flight football. Now if they had said it was in the history of the English Football League then yes, that’s impressive. Well I’m sure Stoke wouldn’t regard it as impressive as it’s hardly something to be proud of, but you know what I mean. Clearly though, the reason they can’t say something as grand as that is more likely to be down to this particular statistic never originally being recorded, certainly not 100 years ago. Or even 50 years ago for that matter. So who knows. What I do know is that as camera technology clearly wasn’t up to the dizzy heights of the 21st Century back then we’re never going to find out. Is It A Bird? A Plane? No It’s Bolt Lightning! The most astounding delivery of statistics that I see every year is during the NFL Superbowl. Every year records are smashed. It’s quite incredible. Its as though we’re living in a world that is continually producing superheroes. Will there be no end? Surely there must be. Usain Bolt is the fastest ever recorded human to run 100m, but there has to come a time when the World Record will simply never be broken. For example, surely it will be impossible for it to ever be run in 5 seconds flat. Right ok, that’s it. Must go. I’m at the barbers for an appointment. I can’t really hold them up any longer otherwise the red dye won’t set properly. No time you see. Afterwards I’m off to my next match. On the way I must remember to pick up my order of a pair of yellow boots, a red shirt and a fancy dress Batman outfit. Oh, and a chocolate bar. No, better make that two bars actually just in case I’m a bit late in setting my new record. Oh, hang on a minute. Oh no… I’ve forgotten to order the broom! Sigh… may be next year then. This entry was posted in Cajuzi, Entertainment, Knowledge and tagged Cajuzi, Football, NFL, records, sport. Bookmark the permalink.